Just a comment about a refrigerator or mini-bar in a hotel room: when I first travelled to the US nearly 30 years ago almost every room I stayed in had these. But on this trip it’s been notable how few rooms now have these items. A mini-bar I can perhaps understand because I’m sure these are open to abuse or theft by some guests, but I think a refrigerator should be a standard item in a hotel room. This must be a deliberate policy to try and stop guests doing what I did most days – going to the local 7-11 or store and stocking up on food and drink for breakfast or other meals. But it doesn’t work – as evidenced that I still went and bought the stuff anyway – and the most irritating aspect is that it makes for a bad customer experience, something the hotels don’t seem to appreciate. To explore some more about Chicago’s history this morning I go on the Untouchables Tour. I’d read about the tour before I left home and it had good reviews. It’s all about the gangster hot – and hit – spots around the city on a bus tour with commentary about the “old hoodlum haunts, brothels, gambling dens and sites of gangland shootouts.” If you want to do it make sure you book in advance – it’s regularly sold out and a few folks who just turned up for the tour I took, hoping to get on, were turned away. The pick-up is outside the giant McDonald’s just down the road, so it’s not far to walk. The two guides – dressed as gangland characters – were very funny and informative throughout the tour. My only criticism is that unlike most other bus tours we never actually get off the bus at any point, so I’m in my seat for the two hours of the tour. I talk to one of the guides afterwards and it seems that none of the locations where gangsters did ‘business’ – and by that I mean physical places such as bars and clubs plus locations where murders and shootings took place – are ‘promoted’ or ‘commemorated’ by the city. For example there are no plaques or trail markers and none of the places have been renovated inside. The reason apparently is that the city thinks it would be seen as condoning or approving of the illegal activities of the gangster period if it did so. As such, there is practically nothing to see at the various locations other than the outside of a building. Many of them don’t have signs or names either, hence the tour operator sees no need to let customers get off the bus. 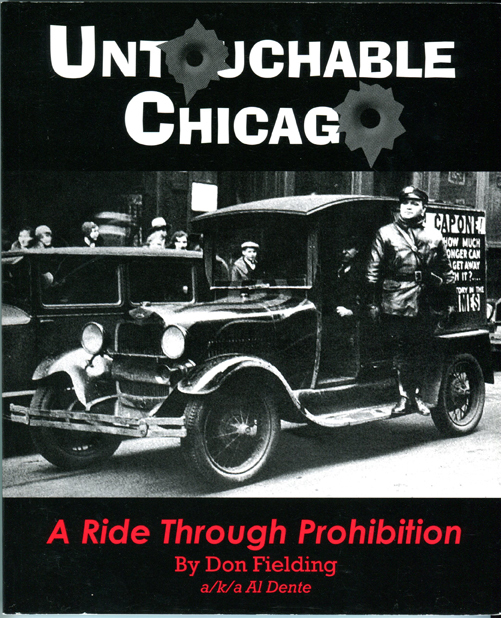 Whilst clearly the Prohibition Era created some pretty unsavoury characters and incidents in Chicago, I think that nearly 95 years after the start of Prohibition that enough time has passed for the city to recognise the historical nature of the time rather than just pretend it didn’t happen. I’m sure some way could be found to acknowledge what went on in a sympathetic and understanding manner – or maybe there’s some deep-seated cultural aspect to this that as a non-Chicagoan I don’t understand. Anyhow, as the tour comes to a close there’s a raffle on board for a couple of prizes and I win the book pictured! The tour is definitely worthwhile though because despite not getting off the bus the stories the guides tell are excellent and paint a good picture of the era. It’s early afternoon by now but I still have loads of time to kill before needing to head out to O’Hare Airport. I’ve seen everything I think I can or want to in Chicago but still the biggest surprise was the complete lack of any tours about the city’s musical heritage. It’s quite shocking really given the role blues, jazz and gospel music have played in Chicago’s history. The guide book mentioned a blues tour but when I contacted the tourism office they said it didn’t run anymore, and all of my attempts to find anything drew a blank. Even Maxwell Street, Chicago’s historical blues thoroughfare, is now mainly a market. Maybe there’s an opportunity for someone here? So despite finding some great – if not the best – music of my trip here in Chicago, I still feel there’s so much more about the city’s musical background and heritage I want to learn about.